We had a gorgeous meal at Antidote Wine Bar recently, a lovely little number just off Carnaby Street in the heart of Soho. Although a wine bar, there is a strong focus on food at Antidote as well. Antidote’s Head Chef is Michael Hazelwood, who cooks under the guidance of Mikael Jonsson, the Chef Patron of Hedone. More than just a one Michelin star restaurant, Hedone is also ranked as the number 60 restaurant on the ‘World’s 50 Best Restaurants’ list. On the ground floor is an all day wine bar offering cheese, charcuterie and small plates, and on the first floor is the restaurant which offers both an a la carte and a tasting menu. The wine list focuses mainly on French wines with a select few options from other countries. All the wines at Antidote are organic and biodynamic with no artificial additives used. 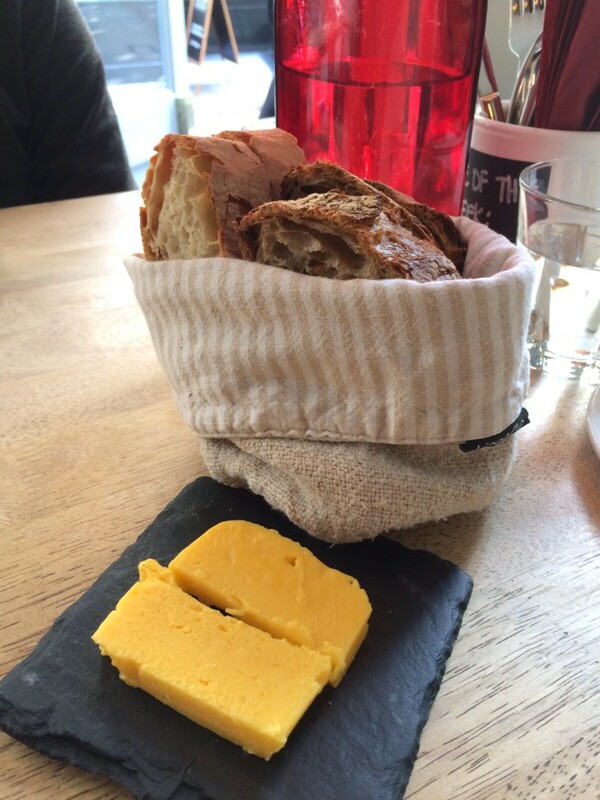 Our excellent meal began with some lovely breads and butter from Hedone. Mikael Jonsson studied the art of bread baking with one of the finest bakers in France, Alex Croquet, and much has been written about the bread at Hedone. Suffice to say, the bread was delicious with a light springy texture. We ordered from the a la carte menu, beginning our meal with the organic egg with shiitake and purslane (£7.50) which was gorgeous. Slow cooked, the egg was runny and soft, and the shiitake was firm and full of umami. 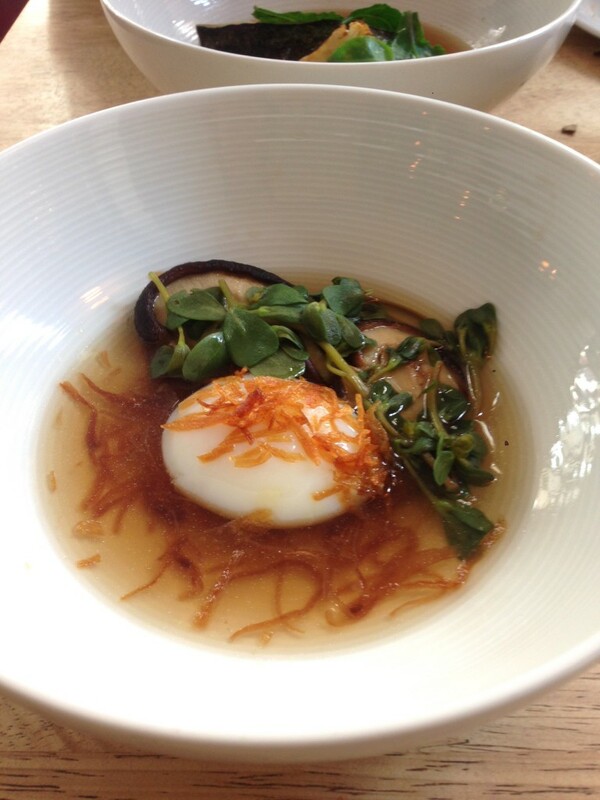 But the highlight of the dish was the lovely shiitake broth which was light and clear with an intense, sweet flavour. 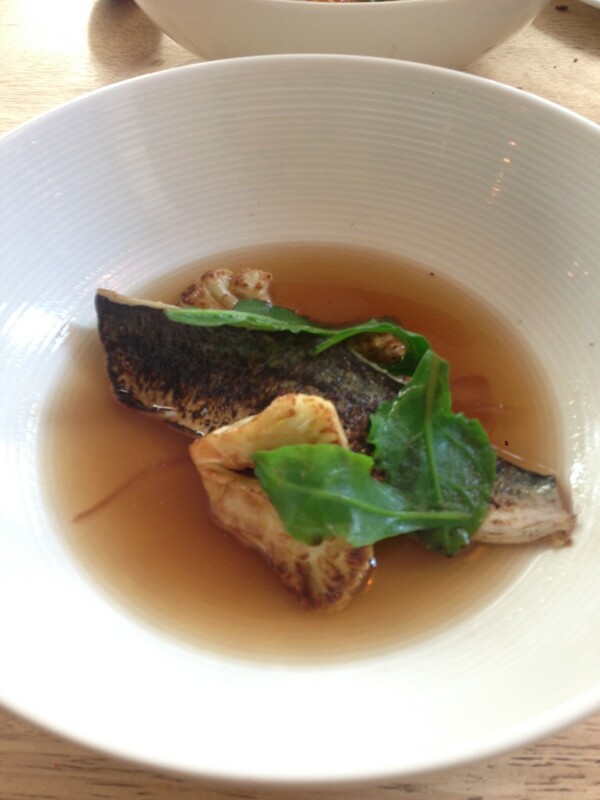 Also wonderful was the mackerel with cauliflower, mushrooms and a seaweed broth (£8). The mackerel had been perfectly cooked, and both the cauliflower and mushrooms worked well in the dish, especially the cauliflower with its slightly charred flavour. But the highlight was again the beautiful broth with its earthy overtones that brought all the elements of this dish together beautifully. 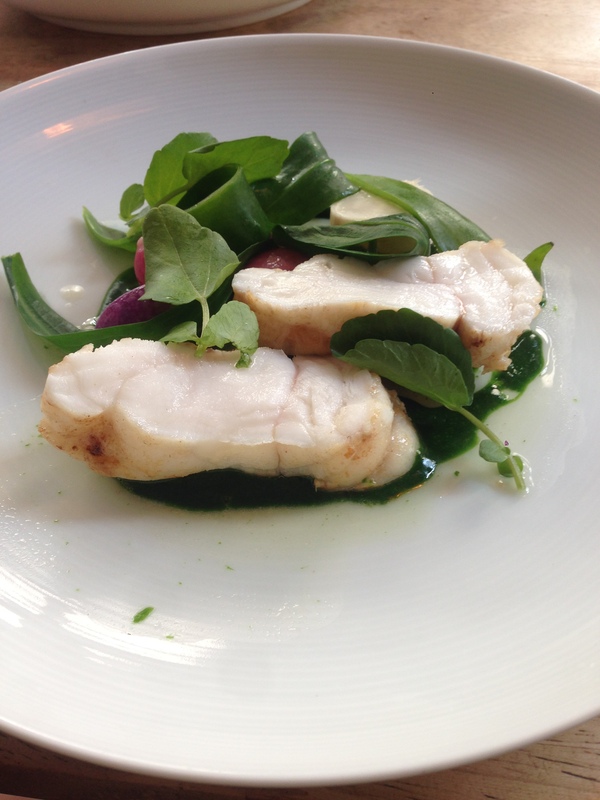 A main of Cornish monkfish with parsley sauce and heirloom radishes was really lovely. The monkfish was well cooked and the radishes had a fresh crunchiness to them. The sauce was excellent, pleasant on the palate with a pleasing smooth texture. It elevated the monkfish to something rather refined. The Welsh black spring lamb with roast celeriac, liquorice and walnut cream was another decent main, but it did not impress as much as the monkfish. The lamb was tender, but it lacked for a punchy flavour. The walnut cream was well made and was a good accompaniment for the lamb. However the roasted celeriac was surprisingly underdone. The use of liquorice was well judged and subtle in the dish. 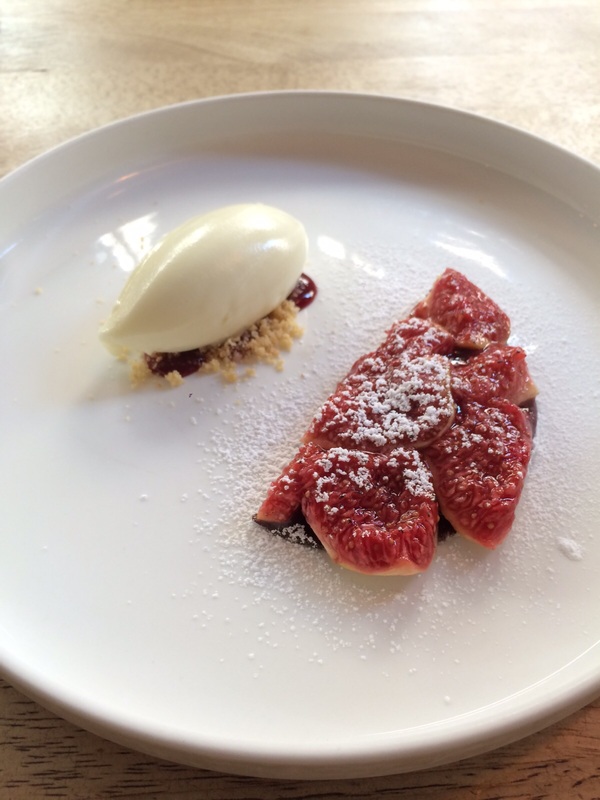 A dessert of fig and damson tart with buttermilk sorbet (£8) didn’t quite live up to the deliciousness of the dishes that preceded it. The base of the dessert was a thin crispbread rather than a sweet pastry which would have been my preference. Also the sorbet was very acidic, and the fig and damson topping wasn’t particularly interesting. Simply put – the food at Antidote was delicious. It didn’t have all the frills of haute cuisine, but it was nevertheless refined and well executed, simple yet elegant. I loved the starters and the monkfish, and although the dessert wasn’t to my taste, I would happily visit Antidote again. 1. 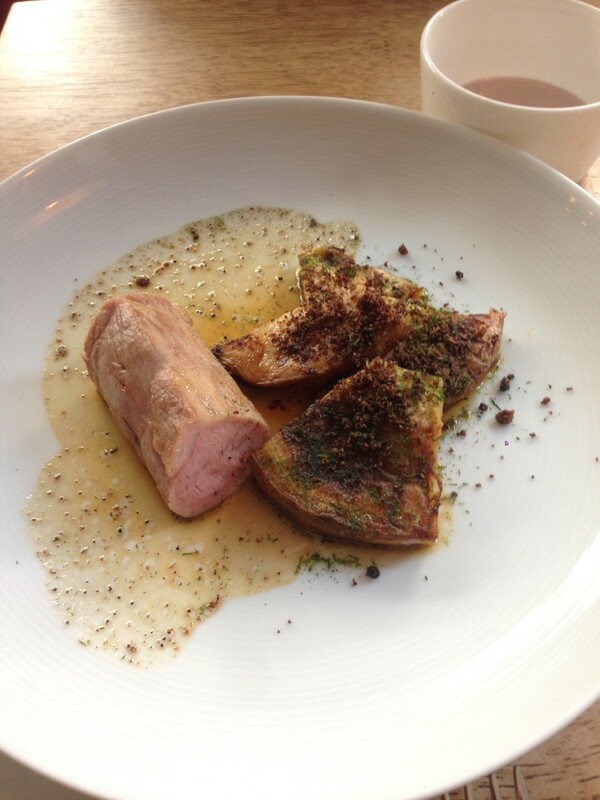 My favourite dishes were the egg, the mackerel and the monkfish. 1. The fig and damson tart was a little boring. Prices: Three courses from the a la carte menu – £31 to £47. Excludes drinks and service. Thank you so much for your comment. I really appreciate the feedback. I am embarking on collating reviews for 50 or so of our restaurants for a Bloggers Guide and would like to use the review you wrote for Antidote. Would you be kind enough to let me know if it is possible to use the review and maybe a photo? Obviously we would credit you and send you a couple of copies once printed.